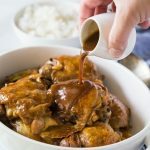 Easy recipe for traditional Instant Pot Chicken Adobo made in your pressure cooker. Combine the chicken thighs, vinegar, low sodium gluten free soy sauce (or coconut aminos for Paleo) garlic cloves (halved), peppercorns and bay leaves in a large pot. Cover and marinate the chicken in the refrigerator for 1 to 3 hours. Turn the chicken in the marinade about halfway through the marinating time. Add the chicken and the all the marinade ingredients to your pressure cooker. Pressure Cook on high setting for 8 minutes and add the pot in pot rice at this point if you are including it, see the notes in the post for more details. Then let it do a natural pressure release until the pressure drops completely. Remove the Chicken and simmer the sauce using the saute setting for about 10 minutes to thicken up a little.